This article is about the film. For other uses, see Chariots of Fire (disambiguation). The film was conceived and produced by David Puttnam, written by Colin Welland, and directed by Hugh Hudson. Ben Cross and Ian Charleson starred as Abrahams and Liddell, alongside Nigel Havers, Ian Holm, Lindsay Anderson, John Gielgud, Cheryl Campbell, and Alice Krige in supporting roles. It was nominated for seven Academy Awards and won four, including Best Picture and Best Original Screenplay. It is ranked 19th in the British Film Institute's list of Top 100 British films. The film is also notable for its memorable electronic theme tune by Vangelis, who won the Academy Award for Best Original Score. The film's title was inspired by the line, "Bring me my Chariot of fire! ", from the William Blake poem adapted into the popular British hymn "Jerusalem"; the hymn is heard at the end of the film. The original phrase "chariot(s) of fire" is from 2 Kings 2:11 and 6:17 in the Bible. In 1919, Harold Abrahams (Ben Cross) enters the University of Cambridge, where he experiences anti-Semitism from the staff, but enjoys participating in the Gilbert and Sullivan club. He becomes the first person to ever complete the Trinity Great Court Run, running around the college courtyard in the time it takes for the clock to strike 12, and achieves an undefeated string of victories in various national running competitions. Although focused on his running, he falls in love with Sybil (Alice Krige), a leading Gilbert and Sullivan soprano. Eric Liddell (Ian Charleson), born in China of Scottish missionary parents, is in Scotland. His devout sister Jennie (Cheryl Campbell) disapproves of Liddell's plans to pursue competitive running, but Liddell sees running as a way of glorifying God before returning to China to work as a missionary. When they first race against each other, Liddell beats Abrahams. Abrahams takes it poorly, but Sam Mussabini (Ian Holm), a professional trainer whom he had approached earlier, offers to take him on to improve his technique. This attracts criticism from the Cambridge college masters (John Gielgud and Lindsay Anderson), who allege it is not gentlemanly for an amateur to "play the tradesman" by employing a professional coach. Abrahams dismisses this concern, interpreting it as cover for anti-Semitic and class-based prejudice. When Eric Liddell accidentally misses a church prayer meeting because of his running, his sister Jennie upbraids him and accuses him of no longer caring about God. Eric tells her that though he intends to return eventually to the China mission, he feels divinely inspired when running, and that not to run would be to dishonour God, saying "I believe that God made me for a purpose. But He also made me fast, and when I run, I feel His pleasure." The two athletes, after years of training and racing, are accepted to represent Great Britain in the 1924 Olympics in Paris. Also accepted are Abrahams' Cambridge friends, Lord Andrew Lindsay (Nigel Havers), Aubrey Montague (Nicholas Farrell), and Henry Stallard (Daniel Gerroll). While boarding the boat to Paris for the Olympics, Liddell discovers the heats for his 100-metre race will be on a Sunday. He refuses to run the race, despite strong pressure from the prince of Wales and the British Olympic committee, because his Christian convictions prevent him from running on the Sabbath. A solution is found thanks to Liddell's teammate Lindsay, who, having already won a silver medal in the 400 metres hurdles, offers to give his place in the 400-metre race on the following Thursday to Liddell, who gratefully agrees. Liddell's religious convictions in the face of national athletic pride make headlines around the world. Liddell delivers a sermon at the Paris Church of Scotland that Sunday, and quotes from Isaiah 40, ending with "But they that wait upon the Lord shall renew their strength; they shall mount up with wings as eagles; they shall run, and not be weary; and they shall walk, and not faint." Abrahams is badly beaten by the heavily favoured United States runners in the 200 metre race. He knows his last chance for a medal will be the 100 metres. He competes in the race, and wins. His coach Sam Mussabini is overcome that the years of dedication and training have paid off with an Olympic gold medal. Now Abrahams can get on with his life and reunite with his girlfriend Sybil, whom he had neglected for the sake of running. Before Liddell's race, the American coach remarks dismissively to his runners that Liddell has little chance of doing well in his now, far longer, 400 metre race. But one of the American runners, Jackson Scholz, hands Liddell a note of support, quoting 1 Samuel 2:30 "He that honors Me I will honor". Liddell defeats the American favourites and wins the gold medal. The British team returns home triumphant. As the film ends, onscreen text explains that Abrahams married Sybil and became the elder statesman of British athletics. Liddell went on to missionary work in China. All of Scotland mourned his death in 1945 in Japanese-occupied China. The film depicts Abrahams as attending Gonville and Caius College, Cambridge with three other Olympic athletes: Henry Stallard, Aubrey Montague, and Lord Andrew Lindsay. Abrahams and Stallard were in fact students there and competed in the 1924 Olympics. Montague also competed in the Olympics as depicted, but he attended Oxford, not Cambridge. Aubrey Montague sent daily letters to his mother about his time at Oxford and the Olympics; these letters were the basis of Montague's narration in the film. The character of Lindsay was based partially on Lord Burghley, a significant figure in the history of British athletics. Although Burghley did attend Cambridge, he was not a contemporary of Harold Abrahams, as Abrahams was an undergraduate from 1919 to 1923 and Burghley was at Cambridge from 1923 to 1927. One scene in the film depicts the Burghley-based "Lindsay" as practising hurdles on his estate with full champagne glasses placed on each hurdle – this was something the wealthy Burghley did, although he used matchboxes instead of champagne glasses. The fictional character of Lindsay was created when Douglas Lowe, who was Britain's third athletics gold medallist in the 1924 Olympics, was not willing to be involved with the film. Abrahams (left) and the Burghley-based Lindsay (right) attempt the Great Court Run. Another scene in the film recreates the Great Court Run, in which the runners attempt to run around the perimeter of the Great Court at Trinity College, Cambridge in the time it takes the clock to strike 12 at midday. The film shows Abrahams performing the feat for the first time in history. In fact, Abrahams never attempted this race, and at the time of filming the only person on record known to have succeeded was Lord Burghley, in 1927. In Chariots of Fire, Lindsay, who is based on Lord Burghley, runs the Great Court Run with Abrahams in order to spur him on, and crosses the finish line just a moment too late. Since the film's release, the Great Court Run has also been successfully run by Trinity undergraduate Sam Dobin, in October 2007. In the film, Eric Liddell is tripped up by a Frenchman in the 400-metre event of a Scotland–France international athletic meeting. He recovers, makes up a 20-metre deficit, and wins. This was based on fact; the actual race was the 440 yards at a Triangular Contest meet between Scotland, England, and Ireland at Stoke-on-Trent in England in July 1923. His achievement was remarkable as he had already won the 100- and 220-yard events that day. Also unmentioned with regard to Liddell is that it was he who introduced Abrahams to Sam Mussabini. This is alluded to: In the film Abrahams first encounters Mussabini while he is watching Liddell race. The film, however, suggests that Abrahams himself sought Mussabini's assistance. Abrahams and Liddell did race against each other once, but not quite as depicted in the film, which shows Liddell winning the final of the 100 yards against a shattered Abrahams at the 1923 AAA Championship at Stamford Bridge. In fact, they raced only in a heat of the 220 yards, which Liddell won, five yards ahead of Abrahams, who did not progress to the final. In the 100 yards, Abrahams was eliminated in the heats and never raced against Liddell, who won the finals of both races the next day. Abrahams' fiancée is misidentified as Sybil Gordon, a soprano at the D'Oyly Carte Opera Company. In fact, in 1936, Abrahams married Sybil Evers, who sang at the D'Oyly Carte, but they did not meet until 1934. Also, in the film, Sybil is depicted as singing the role of Yum-Yum in The Mikado, but neither Sybil Gordon nor Sybil Evers ever sang that role with D'Oyly Carte, although Evers was known for her charm in singing Peep-Bo, one of the two other "little maids from school". Harold Abrahams' love of and heavy involvement with Gilbert and Sullivan, as depicted in the film, is factual. Liddell's sister was several years younger than she was portrayed in the film. Her disapproval of Liddell's track career was creative licence; she actually fully supported his sporting work. Jenny Liddell Somerville cooperated fully with the making of the film and has a brief cameo in the Paris Church of Scotland during Liddell's sermon. At the memorial service for Harold Abrahams, which opens the film, Lord Lindsay mentions that he and Aubrey Montague are the only members of the 1924 Olympic team still alive. However, Montague died in 1948, 30 years before Abrahams' death. The film takes some liberties with the events at the 1924 Olympics, including the events surrounding Liddell's refusal to race on a Sunday. In the film, he doesn't learn that the 100-metre heat is to be held on the Christian Sabbath until he is boarding the boat to Paris. In fact, the schedule was made public several months in advance; Liddell did however face immense pressure to run on that Sunday and to compete in the 100 metres, getting called before a grilling by the British Olympic Committee, the Prince of Wales, and other grandees, and his refusal to run made headlines around the world. The decision to change races was, even so, made well before embarking to Paris, and Liddell spent the intervening months training for the 400 metres, an event in which he had previously excelled. It is true, nonetheless, that Liddell's success in the Olympic 400m was largely unexpected. The film depicts Lindsay, having already won a medal in the 400-metre hurdles, giving up his place in the 400-metre race for Liddell. In fact Burghley, on whom Lindsay is loosely based, was eliminated in the heats of the 110 hurdles (he would go on to win a gold medal in the 400 hurdles at the 1928 Olympics), and was not entered for the 400 metres. The film reverses the order of Abrahams' 100m and 200m races at the Olympics. In reality, after winning the 100 metres race, Abrahams ran the 200 metres but finished last, Jackson Scholz taking the gold medal. In the film, before his triumph in the 100m, Abrahams is shown losing the 200m and being scolded by Mussabini. And during the following scene in which Abrahams speaks with his friend Montague while receiving a massage from Mussabini, there is a French newspaper clipping showing Scholz and Charley Paddock with a headline which states that the 200 metres was a triumph for the United States. In the same conversation, Abrahams laments getting "beaten out of sight" in the 200. The film thus has Abrahams overcoming the disappointment of losing the 200 by going on to win the 100, a reversal of the real order. Eric Liddell actually also ran in the 200m race, and finished third, behind Paddock and Scholz. This was the only time in reality that Liddell and Abrahams competed in the same race. While their meeting in the 1923 AAA Championship in the film was fictitious, Liddell's record win in that race did spur Abrahams to train even harder. Abrahams also won a silver medal as an opening runner for the 4 x 100 metres relay team, not shown in the film, and Aubrey Montague placed sixth in the steeplechase, as depicted. In the film, the 100m bronze medallist is a character called "Tom Watson"; the real medallist was Arthur Porritt of New Zealand, who refused permission for his name to be used in the film, allegedly out of modesty, and his wish was accepted by the film's producers, even though his permission was not necessary. However, the brief back-story given for Watson, who is called up to the New Zealand team from the University of Oxford, substantially matches Porritt's history. With the exception of Porritt, all the runners in the 100m final are identified correctly when they line up for inspection by the Prince of Wales. Jackson Scholz is depicted as handing Liddell an inspirational Bible-quotation message before the 400 metres final: "It says in the Old Book, 'He that honors me, I will honor.' Good luck." In reality, the note was from members of the British team, and was handed to Liddell before the race by his attending masseur at the team's Paris hotel. For dramatic purposes, screenwriter Welland asked Scholz if he could be depicted handing the note, and Scholz readily agreed, saying "Yes, great, as long as it makes me look good." 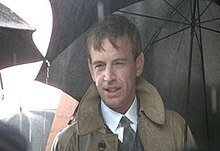 Ian Charleson, who studied the Bible intensively for his role, wrote Eric Liddell's post-race inspirational speech to a working-class crowd. Producer David Puttnam was looking for a story in the mold of A Man for All Seasons (1966), regarding someone who follows his conscience, and felt sports provided clear situations in this sense. He discovered Eric Liddell's story by accident in 1977, when he happened upon a reference book on the Olympics while housebound from the flu in a rented house in Los Angeles. Screenwriter Colin Welland, commissioned by Puttnam, did an enormous amount of research for his Academy Award-winning script. Among other things, he took out advertisements in London newspapers seeking memories of the 1924 Olympics, went to the National Film Archives for pictures and footage of the 1924 Olympics, and interviewed everyone involved who was still alive. Welland just missed Abrahams, who died 14 January 1978, but he did attend Abrahams' February 1978 memorial service, which inspired the present-day framing device of the film. Aubrey Montague's son saw Welland's newspaper ad and sent him copies of the letters his father had sent home – which gave Welland something to use as a narrative bridge in the film. Except for changes in the greetings of the letters from "Darling Mummy" to "Dear Mum" and the change from Oxford to Cambridge, all of the readings from Montague's letters are from the originals. Welland's original script also featured, in addition to Eric Liddell and Harold Abrahams, a third protagonist, 1924 Olympic gold medallist Douglas Lowe, who was presented as a privileged aristocratic athlete. However, Lowe refused to have anything to do with the film, and his character was written out and replaced by the fictional character of Lord Andrew Lindsay. Ian Charleson wrote Eric Liddell's speech to the post-race workingmen's crowd at the Scotland v. Ireland races. Charleson, who had studied the Bible intensively in preparation for the role, told director Hugh Hudson that he didn't feel the portentous and sanctimonious scripted speech was either authentic or inspiring. Hudson and Welland allowed him to write words he personally found inspirational instead. The film was slightly altered for the U.S. audience. A brief scene depicting a pre-Olympics cricket game between Abrahams, Liddell, Montague, and the rest of the British track team appears shortly after the beginning of the original film. For the American audience, this brief scene was deleted. In the U.S., to avoid the initial G rating, which had been strongly associated with children's films and might have hindered box office sales, a different scene was used – one depicting Abrahams and Montague arriving at a Cambridge railway station and encountering two World War I veterans who use an obscenity – in order to be given a PG rating. Puttnam chose Hugh Hudson, a multiple award-winning advertising and documentary filmmaker who had never helmed a feature film, to direct Chariots of Fire. Hudson and Puttnam had known each other since the 1960s, when Puttnam was an advertising executive and Hudson was making films for ad agencies. In 1977, Hudson had also been second-unit director on the Puttnam-produced film Midnight Express. Director Hugh Hudson was determined to cast young, unknown actors in all the major roles of the film, and to back them up by using veterans like John Gielgud, Lindsay Anderson, and Ian Holm as their supporting cast. Hudson and producer David Puttnam did months of fruitless searching for the perfect actor to play Eric Liddell. They then saw Scottish stage actor Ian Charleson performing the role of Pierre in the Royal Shakespeare Company's production of Piaf, and knew immediately they had found their man. Unbeknownst to them, Charleson had heard about the film from his father, and desperately wanted to play the part, feeling it would "fit like a kid glove". Ben Cross, who plays Harold Abrahams, was discovered while playing Billy Flynn in Chicago. In addition to having a natural pugnaciousness, he had the desired ability to sing and play the piano. Cross was thrilled to be cast, and said he was moved to tears by the film's script. 20th Century Fox, which put up half of the production budget in exchange for distribution rights outside of North America, insisted on having a couple of notable American names in the cast. Thus the small parts of the two American champion runners, Jackson Scholz and Charlie Paddock, were cast with recent headliners: Brad Davis had recently starred in Midnight Express (also produced by Puttnam), and Dennis Christopher had recently starred, as a young bicycle racer, in the popular indie film Breaking Away. All of the actors portraying runners underwent a gruelling three-month training intensive with renowned running coach Tom McNab. This training and isolation of the actors also created a strong bond and sense of camaraderie among them. 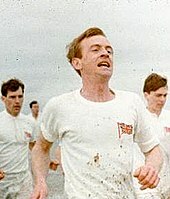 Ian Charleson (foreground) and Ben Cross (left) running in the "Chariots of Fire" music scene which bookends the film. Although the film is a period piece, set in the 1920s, the Academy Award-winning original soundtrack composed by Vangelis uses a modern 1980s electronic sound, with a strong use of synthesizer and piano among other instruments. This was a bold and significant departure from earlier period films, which employed sweeping orchestral instrumentals. The title theme of the film has become iconic, and has been used in subsequent films and television shows during slow-motion segments. Vangelis, a Greek-born electronic composer who moved to Paris in the late 1960s, had been living in London since 1974. Director Hugh Hudson had collaborated with him on documentaries and commercials, and was also particularly impressed with his 1979 albums Opera Sauvage and China. David Puttnam also greatly admired Vangelis's body of work, having originally selected his compositions for his previous film Midnight Express. Hudson made the choice for Vangelis and for a modern score: "I knew we needed a piece which was anachronistic to the period to give it a feel of modernity. It was a risky idea but we went with it rather than have a period symphonic score." The soundtrack had a personal significance to Vangelis: After composing the iconic theme tune he told Puttnam, "My father is a runner, and this is an anthem to him." Hudson originally wanted Vangelis's 1977 tune "L'Enfant", from his Opera Sauvage album, to be the title theme of the film, and the beach running sequence was actually filmed with "L'Enfant" playing on loudspeakers for the runners to pace to. Vangelis finally convinced Hudson he could create a new and better piece for the film's main theme – and when he played the now-iconic "Chariots of Fire" theme for Hudson, it was agreed the new tune was unquestionably better. The "L'Enfant" melody still made it into the film: When the athletes reach Paris and enter the stadium, a brass band marches through the field, and first plays a modified, acoustic performance of the piece. Vangelis's electronic "L'Enfant" track eventually was used prominently in the 1982 film The Year of Living Dangerously. Some pieces of Vangelis's music in the film did not end up on the film's soundtrack album. One of them is the background music to the race Eric Liddell runs in the Scottish highlands. This piece is a version of "Hymne", the original version of which appears on Vangelis's 1979 album, Opéra sauvage. Various versions are also included on Vangelis's compilation albums Themes, Portraits, and Odyssey: The Definitive Collection, though none of these include the version used in the film. Five lively Gilbert and Sullivan tunes also appear in the soundtrack, and serve as jaunty period music which nicely counterpoints Vangelis's modern electronic score. These are: "He is an Englishman" from H.M.S. Pinafore, "Three Little Maids from School Are We" from The Mikado, "With Catlike Tread" from The Pirates of Penzance, "The Soldiers of Our Queen" from Patience, and "There Lived a King" from The Gondoliers. The film also incorporates a major traditional work: "Jerusalem", sung by a British choir at the 1978 funeral of Harold Abrahams. The words, written by William Blake in 1804-8, were set to music by Parry in 1916 as a celebration of England. This hymn has been described as "England's unofficial national anthem", concludes the film and inspired its title. A handful of other traditional anthems and hymns and period-appropriate instrumental ballroom-dance music round out the film's soundtrack. The beach scenes associated with the theme tune were filmed at West Sands, St Andrews. A plaque commemorating the filming can be found there today. The very last scene of the opening titles crosses the 1st and 18th holes of the Old Course at St Andrews Links. All of the Cambridge scenes were actually filmed at Hugh Hudson's alma mater Eton College, because Cambridge refused filming rights, fearing depictions of anti-Semitism. The Cambridge administration greatly regretted the decision after the film's enormous success. Liverpool Town Hall was the setting for the scenes depicting the British Embassy in Paris. The Colombes Olympic Stadium in Paris was represented by the Oval Sports Centre, Bebington, Merseyside. The nearby Woodside ferry terminal was used to represent the embarkation scenes set in Dover. The railway station scenes were filmed in York, using locomotives from the National Railway Museum. The scene depicting a performance of The Mikado was filmed in the Royal Court Theatre, Liverpool with members of the D'Oyly Carte Opera Company who were on tour. Chariots of Fire became a recurring theme in promotions for the 2012 Summer Olympics in London. The film's theme tune was featured at the opening of the 2012 London New Years fireworks celebrating the Olympics, and the film's iconic beach-running scene and theme tune were used in The Sun's "Let's Make It Great, Britain" Olympic ads. The runners who first tested the new Olympic Park were spurred on by the Chariots of Fire theme tune, and the iconic music was also used to fanfare the carriers of the Olympic flame on parts of its route through the UK. The beach-running sequence was also recreated at St. Andrews and filmed as part of the Olympic torch relay. The film's theme was also performed by the London Symphony Orchestra, conducted by Simon Rattle, during the Opening Ceremony of the games; the performance was accompanied by a comedy skit by Rowan Atkinson (as Mr Bean) which included the opening beach-running footage from the film. The film's theme tune was also played during each medal ceremony of the 2012 Olympics. The Chariots of Fire stage adaptation: Stars Jack Lowden and James McArdle flank Vangelis, watching the Olympic Torch Relay set to the iconic tune, from the Gielgud Theatre, July 2012. A stage adaptation of Chariots of Fire was mounted in honour of the 2012 Olympics. The play, Chariots of Fire, which was adapted by playwright Mike Bartlett and included the iconic Vangelis score, ran from 9 May to 16 June 2012 at London's Hampstead Theatre, and transferred to the Gielgud Theatre in the West End on 23 June, where it ran until 5 January 2013. It starred Jack Lowden as Eric Liddell and James McArdle as Harold Abrahams, and Edward Hall directed. Stage designer Miriam Buether transformed each theatre into an Olympic stadium, and composer Jason Carr wrote additional music. Vangelis also created several new pieces of music for the production. The stage version for the London Olympic year was the idea of the film's director, Hugh Hudson, who co-produced the play; he stated, "Issues of faith, of refusal to compromise, standing up for one's beliefs, achieving something for the sake of it, with passion, and not just for fame or financial gain, are even more vital today." Another play, Running for Glory, written by Philip Dart, based on the 1924 Olympics, and focusing on Abrahams and Liddell, toured parts of Britain from 25 February to 1 April 2012. It starred Nicholas Jacobs as Harold Abrahams, and Tom Micklem as Eric Liddell. As an official part of the London 2012 Festival celebrations, a new digitally re-mastered version of the film screened in 150 cinemas throughout the UK. The re-release began 13 July 2012, two weeks before the opening ceremony of the London Olympics. A Blu-ray of the film was released on 10 July 2012 in North America, and was released 16 July 2012 in the UK. The release includes nearly an hour of special features, a CD sampler, and a 32-page "digibook". Since its release Chariots of Fire has received generally positive reviews from critics. As of 2017[update] the film holds an 83% "Certified Fresh" rating on review aggregator website Rotten Tomatoes based on 64 reviews, accompanied by the summary "Decidedly slower and less limber than the Olympic runners at the center of its story, the film nevertheless manages to make effectively stirring use of its spiritual and patriotic themes." For its 2012 re-release, Kate Muir of The Times gave the film five stars, writing: "In a time when drug tests and synthetic fibres have replaced gumption and moral fibre, the tale of two runners competing against each other in the 1924 Olympics has a simple, undiminished power. From the opening scene of pale young men racing barefoot along the beach, full of hope and elation, backed by Vangelis's now famous anthem, the film is utterly compelling." 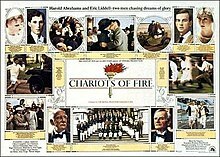 Chariots of Fire was very successful at the 54th Academy Awards, winning four of seven nominations. When accepting his Oscar for Best Original Screenplay, Colin Welland famously announced "The British are coming". At the 1981 Cannes Film Festival the film won two awards and competed for the Palme d'Or. Chapman, James. "The British Are Coming: Chariots of Fire (1981)". In: Past and Present: National Identity and the British Historical Film. London: I.B. Tauris & Co, 2005. pp. 270–298. McLaughlin, John (February 2012). "In Chariots They Ran". Runner's World. Emmaus, Pennsylvania: Rodale. ^ Dans, Peter E. Christians in the Movies: A Century of Saints and Sinners. Rowman & Littlefield, 2009. p. 223. ^ a b c McLaughlin, John. "In Chariots They Ran". Runner's World. February 2012. ^ Chapman, pp. 275, 295. ^ "Modern-day hero runs away with Chariots of Fire challenge." Daily Mail 27 October 2007. ^ Ramsey, Russell W. (1987). God's Joyful Runner. Bridge Publishing, Inc. p. 54. ISBN 0-88270-624-1. ^ "A Sporting Nation: Eric Liddell". BBC.co.uk. Retrieved 13 March 2012. ^ McCasland, David (2001). Pure Gold: A New Biography of the Olympic Champion Who Inspired Chariots of Fire. Discovery House. ISBN 1572931302. ^ a b Ryan (2012), p. 188. ^ Ramsey, Russell W. A Lady – A Peacemaker. Boston: Branden Publishing Company, 1988. ^ Murray, Feg. "DID YOU KNOW THAT ...". Los Angeles Times. 24 June 1924. Full headline reads, "Did You Know That Famous Scotch Sprinter Will Not Run in the Olympic 100 Metres Because The Trials Are Run on Sunday". ^ "Recollections by Sir Arthur Marshall". Content.ericliddell.org. Archived from the original on 15 February 2009. Retrieved 28 April 2009. ^ Arthur Espie Porritt 1900–1994. "Reference to Porritt's modesty". Library.otago.ac.nz. Retrieved 28 April 2009. ^ The quoted passage is First Samuel 2:30. ^ Reid, Alasdair. "Harold Abrahams and Eric Liddell". The Times. 1 August 2000. ^ "Britain's 1924 Olympic Champs Live Again in 'Chariots of Fire'—and Run Away with the Oscars". People. 17 (18). 10 May 1982. Retrieved 22 August 2009. ^ Goodell, Gregory. Independent Feature Film Production: A Complete Guide from Concept Through Distribution. New York: St. Martin's Press, 1982. p. xvii. ^ Nichols, Peter M. The New York Times Essential Library, Children's Movies: A Critic's Guide to the Best Films Available on Video and DVD. New York: Times Books, 2003. p. 59. ^ Puttnam interviewed in BBC Radio obituary of Jack Valenti. ^ a b Round, Simon. "Interview: Hugh Hudson". The Jewish Chronicle. 10 November 2011. ^ Ian McKellen, Hugh Hudson, Alan Bates, et al. For Ian Charleson: A Tribute. London: Constable and Company, 1990. pp. xix, 9, 76. ^ a b c Wings on Their Heels: The Making of Chariots of Fire. (2005 video; featurette on 2005 DVD). ^ MacNab, Geoffrey. "Everyone Was a Winner when British Talent Met the Olympic Spirit". The Independent. 13 April 2012. ^ Hubbert, Julie. Celluloid Symphonies: Texts and Contexts in Film Music History. University of California Press, 2011. p. 426. ^ Sanderson, Blair. Hubert Parry. AllMusic Guide, reprinted in Answers.com. ^ Tours: St Andrews Archived 14 June 2010 at the Wayback Machine Gray Line Tours. Describes Grannie Clark's Wynd, a public right-of-way over the 1st and the 18th of the Old Course, which was where the athletes were filmed running for the final titles shot. ^ a b "Chariots of Fire". Where Did They Film That?. Retrieved 18 February 2007. ^ Bradley, Ian, ed.The Complete Annotated Gilbert and Sullivan. Oxford University Press, 2005. p. 576. ^ "Let's Make It Great, Britain"
^ Line the Streets: Celebration Guide Archived 24 April 2012 at the Wayback Machine. London 2012. p. 4. ^ "News: Torch Relay". BBC. Retrieved 20 March 2018. ^ Rees, Jasper. "Chariots of Fire Is Coming!" The Arts Desk. 18 April 2012. ^ "Cast Announced for Hampstead Theatre's Chariots of Fire; Opens May 9". Broadway World. 2 April 2012. ^ Girvan, Andrew. "Black Watch's Lowden plays Eric Liddell in Chariots of Fire". What's on Stage. 9 March 2012. ^ Twitter: Chariots Tweeter, 16 April 2012, 18 April 2012. ^ Rees, Jasper. "Chariots of Fire: The British Are Coming... Again". The Daily Telegraph. 3 May 2012. ^ Jury, Louise. "Theatre to Run Chariots of Fire with Vangelis Tracks". London Evening Standard. 30 January 2012. ^ Elkin, Susan. "Running for Glory". The Stage. 2 March 2012. ^ "Olympic Play Is Victory on Stage" Archived 5 May 2013 at Archive.today. This Is Kent. 10 February 2012. ^ "Chariots of Fire Returns to UK Cinemas Ahead of the Olympics" Archived 28 March 2012 at the Wayback Machine. British Film Institute. 23 March 2012. ^ Sluss, Justin. "1981 Hugh Hudson Directed Film Chariots of Fire Comes to Blu-ray in July". HighDefDiscNews.com. ^ . Chariots of Fire (1981) - Rotten Tomatoes. Retrieved 3 January 2017. ^ . "First Night Reviews: Chariots of Fire". Retrieved 3 January 2017. ^ "Festival de Cannes: Chariots of Fire". festival-cannes.com. Archived from the original on 18 January 2012. Retrieved 31 May 2009.